A cyclohexane molecule in chair conformation. Hydrogen atoms in axial positions are shown in red, while those in equatorial positions are in blue. A cyclohexane conformation is any of several three-dimensional shapes that a cyclohexane molecule can assume while maintaining the integrity of its chemical bonds. The internal angles of a flat regular hexagon are 120°, while the preferred angle between successive bonds in a carbon chain is about 109.5°, the tetrahedral angle. Therefore, the cyclohexane ring tends to assume certain non-planar (warped) conformations, which have all angles closer to 109.5° and therefore a lower strain energy than the flat hexagonal shape. The most important shapes are called chair, half-chair, boat, and twist-boat. The molecule can easily switch between these conformations, and only two of them — chair and twist-boat — can be isolated in pure form. Cyclohexane conformations have been extensively studied in organic chemistry because they are the classical example of conformational isomerism and have noticeable influence on the physical and chemical properties of cyclohexane. In 1890, Hermann Sachse, a 28-year-old assistant in Berlin, published instructions for folding a piece of paper to represent two forms of cyclohexane he called symmetrical and unsymmetrical (what we would now call chair and boat). He clearly understood that these forms had two positions for the hydrogens (again, to use modern terminology, axial and equatorial), that two chairs would probably interconvert, and even how certain substituents might favor one of the chair forms. Because he expressed all this in mathematical language, few chemists of the time understood his arguments. He had several attempts at publishing these ideas, but none succeeded in capturing the imagination of chemists. His death in 1893 at the age of 31 meant his ideas sank into obscurity. It was only in 1918 when Ernst Mohr, based on the molecular structure of diamond that had recently been solved using the then very new technique of x-ray crystallography, was able to successfully argue that Sachse's chair was the pivotal motif. 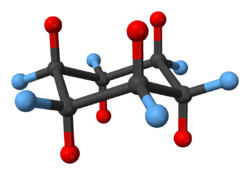 Derek Barton and Odd Hassel shared the 1969 Nobel Prize for work on the conformations of cyclohexane and various other molecules. The carbon-carbon bonds along the cyclohexane ring are sp³ hybrid orbitals, which have tetrahedral symmetry. Therefore, the angles between bonds of a tetravalent carbon atom have a preferred value θ ≈ 109.5°. The bonds also have a fairly fixed bond length λ. On the other hand, adjacent carbon atoms are free to rotate about the axis of the bond. Therefore, a ring that is warped so that the bond lengths and angles are close to those ideal values will have less strain energy than a flat ring with 120° angles.For each particular conformation of the carbon ring, the directions of the 12 carbon-hydrogen bonds (and therefore the positions of the hydrogen atoms) are fixed. There are exactly eight warped polygons with six distinguished corners that have all internal angles equal to θ and all sides equal to λ. They comprise two ideal chair conformations, where the carbons alternately lie above and below the mean ring plane; and six ideal boat conformations, where two opposite carbons lie above the mean plane, and the other four lie below it. In theory, a molecule with any of those ring conformations would be free of angle strain. However, due to interactions between the hydrogen atoms, the angles and bond lengths of the actual chair forms are slightly different from the nominal values. For the same reasons, the actual boat forms have slightly higher energy than the chair forms. Indeed, the boat forms are unstable, and deform spontaneously to twist-boat conformations that are local minima of the total energy, and therefore stable. Each of the stable ring conformations can be transformed into any other without breaking the ring. However, such transformations must go through other states with stressed rings. In particular, they must go through unstable states where four successive carbon atoms lie on the same plane. These shapes are called half-chair conformations. The two chair conformations have the lowest total energy, and are therefore the most stable, and have D3d symmetry. In the basic chair conformation, the carbons C1 through C6 alternate between two parallel planes, one with C1, C3 and C5, the other with C2, C4, and C6. The molecule has a symmetry axis perpendicular to these two planes, and is congruent to itself after a rotation of 120° about that axis. The two chair conformations have the same shape; one is congruent to the other after 60° rotation about that axis, or after being mirrored across the mean plane. The perpendicular projection of the ring onto its mean plane is a regular hexagon. All C-C bonds are tilted relative to the mean plane, but opposite bonds (such as C1-C2 and C4-C5) are parallel to each other. As a consequence of the ring warping, six of the 12 carbon-hydrogen bonds end up almost perpendicular to the mean plane and almost parallel to the symmetry axis, with alternating directions, and are said to be axial. The other six C-H bonds lie almost parallel to the mean plane, and are said to be equatorial. The precise angles are such that the two C-H bonds in each carbon, one axial and one equatorial, point in opposite senses relative to the symmetry axis. Thus, in a chair conformation, there are three C-H bonds of each kind — axial "up", axial "down", equatorial "up", and equatorial "down"; and each carbon has one "up" and one "down", and one axial and one equatorial. The hydrogens in successive carbons are thus staggered so that there is little torsional strain. This geometry is often preserved when the hydrogen atoms are replaced by halogens or other simple groups. The conversion from one chair shape to the other is called ring flipping or chair-flipping. Carbon-hydrogen bonds that are axial in one configuration become equatorial in the other, and vice versa; but their relative positions—their "up" or "down" character—remains the same. In cyclohexane, the two chair conformations have the same energy, and at 25 °C, 99.99% of all molecules in a cyclohexane solution will be in a chair conformation. In cyclohexane derivatives, the two chair conformations may have different energies, depending upon the identity and location of the substituents. For example, in methylcyclohexane the lowest energy conformation is a chair one where the methyl group is in equatorial position. This configuration reduces interaction between the methyl group (on carbon number 1) and the hydrogens at carbons 3 and 5; more importantly, it avoids two gauche butane interactions (of the C1-CH3 bond with the C2-C3 and C5-C6 ring bonds). Similarly, cis-1,3-dimethylcyclohexane usually has both methyls in the equatorial position so as to avoid interaction between them. In six-membered heterocycles such as pyran, a substituent next to an heteroatom may prefer the axial position due to the anomeric effect. Finally, the preference of a substituent towards the equatorial conformation is measured in terms of its A value, which is the Gibbs free energy difference between the two chair conformations, with the substituent in equatorial or in axial position. A positive A value indicates preference towards the equatorial position. The magnitude of the A values ranges from nearly zero for very small substituents such as deuterium, to about 5 kcal/mol for very bulky substituents such as the tert-butyl group. In the basic boat conformation (C2v symmetry), carbons C2, C3, C5 and C6 are coplanar, while C1 and C4 are displaced away from that plane in the same direction. Bonds C2-C3 and C5-C6 are therefore parallel. In this form, the molecule has two perpendicular planes of symmetry as well as a C2 axis. The boat conformations have higher energy than the chair conformations. The interaction between the two flagpole hydrogens, in particular, generates steric strain. There is also torsional strain involving the C2-C3 and C5-C6 bonds, which are eclipsed. Because of this strain, the boat configuration is unstable (not a local minimum of the energy function). The twist-boat conformation, sometimes called twist (D2 symmetry) can be derived from the boat conformation by applying a slight twist to the molecule about the axes connecting the two unique carbons. The result is a structure that has three C2 axes and no plane of symmetry. The concentration of the twist-boat conformation at room temperature is very low (less than 0.1%) but at 1073 Kelvin it can reach 30%. Rapid cooling from 1073 K to 40 K will freeze in a large concentration of twist-boat conformation, which will then slowly convert to the chair conformation upon heating. The half-chair conformation is a transition state with C2 symmetry generally considered to be on the pathway between chair and twist-boat. It involves rotating one of the dihedrals to zero such that four adjacent atoms are coplanar and the other two atoms are out of plane (one above and one below). At room temperature there is a rapid equilibrium between the two chair conformations of cyclohexane. The interconversion of these two conformations has been much debated and still lacks consensus. What is known is that the twist-boat and chair are both energy minima—the twist-boat being a local minimum; the chair being a global minimum (ground state). The half-chair state (2, below) is the transition state in the interconversion between the chair and twist-boat conformations. Due to the D2 symmetry of the twist-boat, there are two energy-equivalent pathways that it can take to two different half-chair conformations, leading to the two different chair conformations of cyclochexane. Thus, at a minimum, the interconversion between the two chair conformations involves the following sequence: chair - half-chair - twist-boat - half-chair' - chair'. The conformations involve following order of stability: chair form > twist boat form > boat form > half-chair form. The boat conformation (4, below) is also a transition state, allowing the interconversion between two different twist-boat conformations. While the boat conformation is not necessary for interconversion between the two chair conformations of cyclohexane, it is often included in the reaction coordinate diagram used to describe this interconversion because its energy is considerably lower than that of the half-chair, so any molecule with enough energy to go from twist-boat to chair also has enough energy to go from twist-boat to boat. Thus, there are multiple pathways by which a molecule of cyclohexane in the twist-boat conformation can achieve the chair conformation again. Cyclohexane rings can be forced to adopt various specific geometries when substituents or other structural details create conformational constraints, for example, when the cyclohexane is part of a bridged compound. A simple example is norbornane, where the cyclohexane part is a boat-like conformation because the carbon bridge across the ring forces carbons 1 and 4 to be closer than a chair conformation allows. Twistane contains four cyclohexane rings, each of which is forced into a twist-boat conformation. Cis-1,4-di-tert-butylcyclohexane has an axial tert-butyl group in the chair conformation and conversion to the twist-boat conformation places both groups in more favorable equatorial positions. As a result, the twist-boat conformation is more stable by 0.47 kcal/mol (1.96 kJ/mol) at 125 K as measured by NMR spectroscopy. In cyclohexane-1,4-dione with the steric 1,4-hydrogen interaction removed, the actual stable conformation is the twist-boat. 2,5-di-tert-butyl-1,4-cyclohexanediol present in boat or twist-boat form "also intra-H-bond"
Heterocyclic analogs of cyclohexane exist, and some have stable twist-boat conformations. 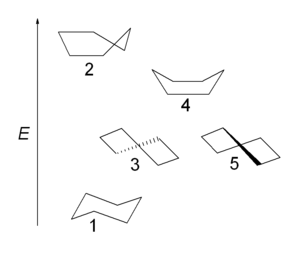 1,2,4,5-tetrathiane, an organosulfur compound with four methylene bridges replaced by sulfur atoms, lacks the unfavorable 1,3-diaxial interactions of cyclohexane, and its twist-boat conformation is populated; in the corresponding tetramethyl structure, 3,3,6,6-tetramethyl-1,2,4,5-tetrathiane, the twist-boat conformation actually dominates. 1 2 3 Nelson, Donna J.; Brammer, Christopher N. (2011). "Toward Consistent Terminology for Cyclohexane Conformers in Introductory Organic Chemistry". Journal of Chemical Education. American Chemical Society. 88 (3): 292–294. Bibcode:2011JChEd..88..292N. doi:10.1021/ed100172k. ↑ Bragg WH, Bragg WL; Bragg (1913). "The structure of the diamond". Nature. 91 (2283): 557. Bibcode:1913Natur..91..557B. doi:10.1038/091557a0. ↑ Bragg WH, Bragg WL; Bragg (1913). "The structure of the diamond". Proc. R. Soc. Lond. A89 (610): 277. Bibcode:1913RSPSA..89..277B. doi:10.1098/rspa.1913.0084. ↑ H. Sachse, Chem. Ber, 1890, 23, 1363; Z. Physik. Chem, 1892, 10, 203; Z. Physik. Chem., 1893, 11, 185–219. ↑ This history is nicely summarized here:. ↑ Squillacote, M.; Sheridan, R. S.; Chapman, O. L.; Anet, F. A. L. (1975-05-01). "Spectroscopic detection of the twist-boat conformation of cyclohexane. Direct measurement of the free energy difference between the chair and the twist-boat". Journal of the American Chemical Society. 97 (11): 3244–3246. doi:10.1021/ja00844a068. ISSN 0002-7863. Colin A. Russell, 1975, "The Origins of Conformational Analysis," in van't Hoff-Le Bel Centennial, O. B. Ramsay, Ed. (ACS Symposium Series 12), Washington, D.C.:American Chemical Society, pp. 159–178. William Reusch, 2010, "Ring Conformations" and "Substituted Cyclohexane Compounds," in Virtual Textbook of Organic Chemistry, East Lansing, MI, USA:Michigan State University, see and , accessed 20 June 2015.